Change is the only constant! Businesses are susceptible to constant change in customer expectations or demand for new services in line with market shifts. In today’s competitive environment, agility in responding to change is the key to success for every business. Needless to say, the IT systems that support the businesses need to be equally agile in accommodating any such change. Accordingly, the IT industry has been embracing agile processes and practicing agile software delivery methods. “DevOps” is the most recent of such approaches which is widely acknowledged as an efficient approach to handling the ever-changing complex business scenarios. It is about accelerating the time-to-market of a product / service, from conceptualization of an idea to production release to customer feedback to enhancements based on that feedback. DevOps, an extension of agile software development methodology, lays emphasis on communication, collaboration, and integration among various stakeholders in the software development process, i.e. development, QA, and operations. The two key components of DevOps practice are Continuous Integration & Continuous Delivery. Continuous Integration is a key component of agile practice that ensures software is built and tested regularly and release bug-fixes rapidly. It requires members of a team to integrate their work frequently on a daily basis. Each check-in is then verified by an automated build, which allows early detection of defects. Since Continuous Integration identifies defects early in the development, defects are usually less complex and easy to resolve. Employing Continuous Integration tools and automation testing tools is typical in a DevOps cycle. Continuous Delivery is the concept that takes Continuous Integration to the next level and extending agile practice beyond development in a DevOps cycle. Continuous Delivery plays an important role in today’s age of agile. Continuous Delivery makes it possible to constantly adapt software corresponding to user feedback, changes in business strategy and shifts in the market. In a Continuous Delivery process, all the teams (test, support, and development) collaborate and work closely to automate and streamline the build, test, and release cycles. Successful Continuous Delivery process results into shortened iterations, minimized risks, reduced costs, and accelerated time to market by frequent releases. However, a smooth, flawless automated Continuous Delivery process is difficult to realize. Today’s informed customers demand seamless user experience. Applications need an extraordinary connectivity and dependence between processes, systems, and infrastructure. Testing various complex applications, products, and services can pose a big challenge as testing needs to make sure that high-quality software is delivered at fast-track speed. Continuous Testing plays a crucial role in Continuous Delivery. It implicates usage of methods and concepts of agile development for the testing and QA process, offering more efficient testing process. Continuous Testing needs automated end-to-end testing solutions that integrate existing development processes while excluding errors and enabling continuity throughout SDLC. 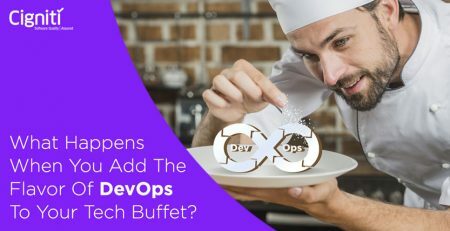 As DevOps encourages a high level of coordination among various teams in the development value chain, at times, it erases the boundaries of various roles. It requires everyone to contribute across the value chain as and when needed. Therefore, a developer can configure deployments, QA engineers can configure automation test cases, and deployment engineers can add test cases to the QA repository. Together, all of them are responsible for the quality, and must adhere to the timelines of all deliverables. Development teams should begin Continuous Testing with testing performance and functionality of the code that they developed. They may utilize open source tools such as Selenium for testing. Tests can include functional, performance, UI, API and more along with regression tests to ensure a comprehensive test coverage. However, tests should be easy so that developers can create and execute them on their own. DevOps teams have to configure a Continuous Integration environment so as to use the appropriate tests. Developers receive an automatic message in case of any build failures. They need to conclude the Continuous Integration process as fast as possible. QA testers need to ensure that tests run in parallel in order to keep the process moving. Each and every release needs to pass an acceptance test on deployment conducted by the Operations team. In post-production phase, operations managers use a few monitoring tools to test the application continuously to monitor the efficiency of apps. A wide-ranging set of tests can run 24/7 that can send automatic failure alerts. Continuous Testing, when implemented diligently, allows flawless continuity in the delivery cycle. Integrating a fully automated Continuous Testing process into the SDLC is the most effective solution for a successful Continuous Delivery process. Today, most of the organizations have to deal with tight deadlines and ever-changing demands from an informed customer segment. Cigniti, as an early adopter of agile methodologies and DevOps, can help you in your automated testing needs, accomplishing your delivery schedules, and bolstering your agile development processes. Please write to us at contact@cigniti.com to know more about DevOps QA. 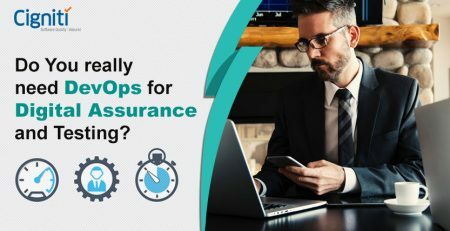 Do You really need DevOps for Digital Assurance and Testing? 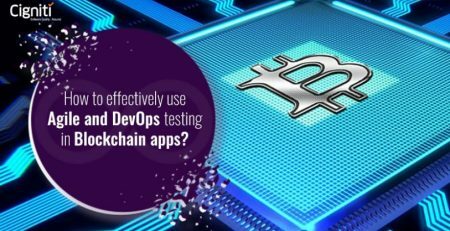 How to effectively use Agile and DevOps testing in Blockchain apps?